Giving your dog a regular winter dog massage can help to relieve aches and pains and is also great for older dogs with arthritis. Winter is here, which means we get to enjoy hearty, filling meals and warm, log fires. However the colder weather can also mean stiff joints and slower movements for our dogs. Below you will find tips on how to give a winter dog massage at home. 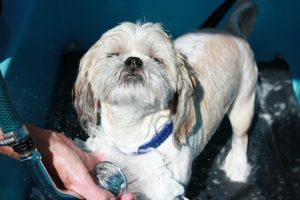 Aussie Pooch Mobile also provides Pooch Massage as an additional service to add onto their regular classic hydrobath service. This Pooch Massage is performed by using pressurised water from the hydrobath. A specific hands on routine that has been designed by human massage therapists is also used. Furthermore touch brings a tranquility, comfort and oneness to your dog. Pooch Mobile Aromatherapy oils, that have been specifically designed for dogs, are also added to the bath water. These can help to calm your dog and can also help to improve skin problems. Your dog will be in doggy heaven after the Aussie Pooch Mobile Pooch Massage. 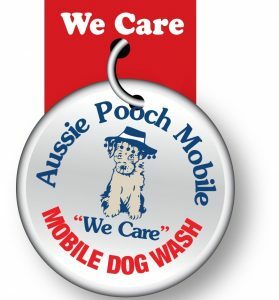 Ask your local Aussie Pooch Mobile groomer if they can perform a Pooch Massage on your dog with their next Classic Hydrobath Service. Note: not all groomers perform this service.